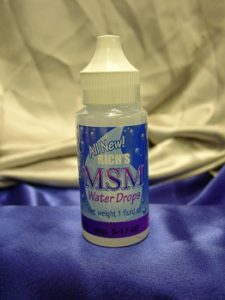 MSM Water Drops 1 oz. (30 ml) Rich DistributingIngredients: 5% MSM (maximum amount possible without causing irritation to mucous membranes), and ionic zinc (natural antibiotic, which is also a nutrient for the skin, eyes, ears and nose). Kornax price: $3.06 Zinc & MSM Spray 4 oz (118 ml) AngstromIngredients: Purified Water, Zinc, MethylSulfonylMethane (MSM). MSM Water Drops provide the cellular nutrition necessary to make the outer tissues soft and permeable. MSM Water Drops are safe for all topological uses. Sterile and nontoxic, MSM Water Drops contain no chemicals to irritate your skin. MSM Water Drops can be used for all topological applications. With the addition of ionic zinc, to prevent bacterial contamination, MSM Water Drops are even more effective than before. Your skin is like a water balloon. The outer tissue normally allows fluids to flow through the membrane wall, which acts like a filter supplying nutrition and cleaning out particles keeping your epidermis clear so your veins are good. When the membranes become tough like leather, the fluids are trapped and the particles start to build up. If the build up continues it will seem as if you are looking through a frosted glass. Copyright © 2002, Bill Rich Distributing, Inc. All Rights Reserved. Rich Distributing is in no way responsible or obligated to verify the statements made on *This statement has not been evaluated by the FDA. This product is not intended to diagnose, treat, cure or prevent any disease. Regarding suggested dosage, please read the page about Recommended Daily Allowances.